Thoughts and prayers with your sister for a successful surgery and a speedy recovery. oh man sorry to hear about your sister, sounds like everything went well so that is good! Prayers for a speedy recovery for your sister here in Houston. Pass on to your sister the LSU fans are praying for her speedy recovery. Thanks for the info, 357. Prayers for your sister and a speedy recovery, 357! Any recent or new update on P Kelly Lynch? What I’m hearing unless Lynch is coming to town this weekend to see the electricity in Baton Rouge this weekend, she either going to Florida or FSU... I believe the 19 class is coming to town this week wouldn’t be a bad look to have her in too. Man Beth needs to get on this girl. Lynch or the 2019 commits? The commits were roaming the campus and tiger stadium earlier. Looked like everyone was having a great time. There were some other girls with the group that I didn't recognize. I know one of the 2019 commits dads, asked him earlier and he said she wasn't there earlier today. Unless she showed up late this evening or is planning on coming tomorrow morning/afternoon. I hope she does, campus will be electric tomorrow. That's the answer I was hoping to hear... just hoping you're not a Diamond Backer talking to our commitments because that is a big time no no. I saw them all too and will coach against one, but we're not supposed to talk to anyone in their family until they sign so I stayed far away from them. I cant wait until the season to start! Lol i am so intrigued by who will start in the infield. The last couple years with Walljasper and Hoover, i can understand why the lease for non producing starters were longer. This year that should not be the case. Our depth is really long this year and all jobs should be constantly up for competition. Andrews, Doyle, and Sanchez are the ONLY three players that should be starters right now. Every other position is up for competition. Our freshmen infielders are both looking really good in Perkins,Tidwell, and Clark. There’s no room for a struggling Sanchez, Schulte, Serrett, etc. We should not have to play players who are hitting under .250. That’s unacceptable and the only reason we succeeded is because we had two great pitchers in the circle. But wow im excited. We have a really good team. I think we have a better “team” than last year. Last year our team was Hoover, Walljasper, Doyle, Andrews. This year i think we are more well rounded. We have so many players that can contribute. ALL of our freshmen look like they can help us succeed. Our returning players will look to improve. The KEY to our season, are our Seniors. Serrett, Schulte, Schlattman, S. Sanchez, Thornhill, and Bourg. They could ALL be key components and can help this team. At the end of the year, Schlattman was on fire. Serrett and S. Sanchez both can be better. Schulte hit damn there 30 homeruns in JUCO and only hit 1 last year. She should improve and give us some added power. Thornhill was the most improved last year until she got hurt. She should be better. And Bourg will give us a spark off the bench. Questions are, where will Clark play? Will Amanda Doyle spend some time at third? Will Clark and Sunseri share at bats at DH? Who will play CF? And a fun question: Who will lead the team in HR? Lol this lineup has 4 (maybe 5 with Schlattman) players capable of hitting 10+ homeruns. Wildcards on this team are Tidwell and Perkins. Tidwell is just a very powerful girl who can hit homeruns and will get a chance to show her power. 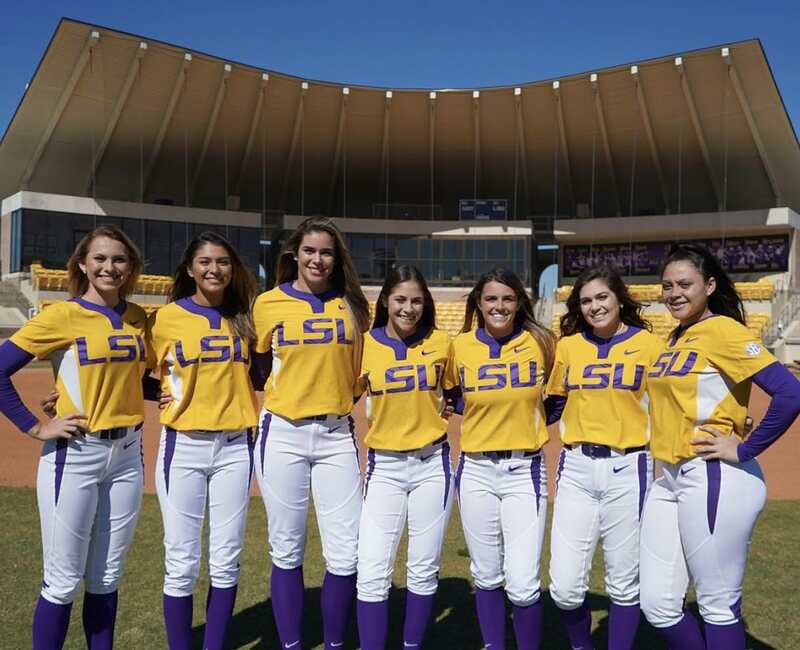 Perkins has looked very good in fall ball, but the only problem is, our infield has all returning starters back and just added Amanda Sanchez. I for one think our pitching will be good. Beth will find a way to work her magic. After that Florida series where we almost won with out Hoover and mostly Walljasper, I’m very confident in the staff. Lastly, Do any of y’all know if the ASU transfers are looking at LSU? For Gibson our infield is stacked, but we most definitely can find a spot for her and for Juarez, she just takes our team to the next level. That first lineup is probably gonna be what it looks like for the season but Clark will get her time in as well, she's a good hitter. A year more experienced freshmen and sophomore class with the addition of Amanda will be big for us this year, its a strong group. Hoping Serrett can give us a little more this season at the plate and have a great senior year. If we can get the Schlattman of the 2nd half of last season we will be in really good shape. I do have to say Perkins has been a wonderful surprise this fall and has stood out. If she keeps it up it will be hard for Torina to not get her the at bats. She just has a great approach at the plate. The freshmen pitchers will be fun to watch as they develop, they have shown some great stuff this fall and will only get better. I forgot to ask you how Cummins hit the other night?